Animals and Technology: How Drones are Helping Whales – FIREPAW, Inc. While some whale populations are slowly recovering from near extinction, others are still in danger. Countries like Japan and Iceland still hunt whales, but the new research could help save them. And hunting might not be the only problem. It’s hard to know what has an effect on whales. There may be other human actions stressing them that researchers haven’t even considered. Researchers at Ocean Alliance, a nonprofit dedicated to conservation efforts, are using drones capture the breathtaking image with aerial photography — as well as the genetic material in petri dishes. Ocean Alliance created the “Snotbot,” a drone they designed to capture both images of the whales and live biological samples of the “snot” the animals exhale through their blow holes. The team mounted petri dishes to the drone’s base so that when the drone hovers above a breaching whale, the propellers create a vortex. This pushes the whale’s spray down into the sample trays. That means less stress for the whales and a more accurate biological sample. For the first time ever, the team is able to peer into the lungs of the world’s largest animals without disturbing them. The samples they collect contain a biological treasure trove of mammalian DNA, microbiome, stress and pregnancy hormones. At Oregon State University, Professor Scott Baker is adding the information collected by the Snotbot to a catalog of 3,000 whales that he and his team have been studying for 35 years. 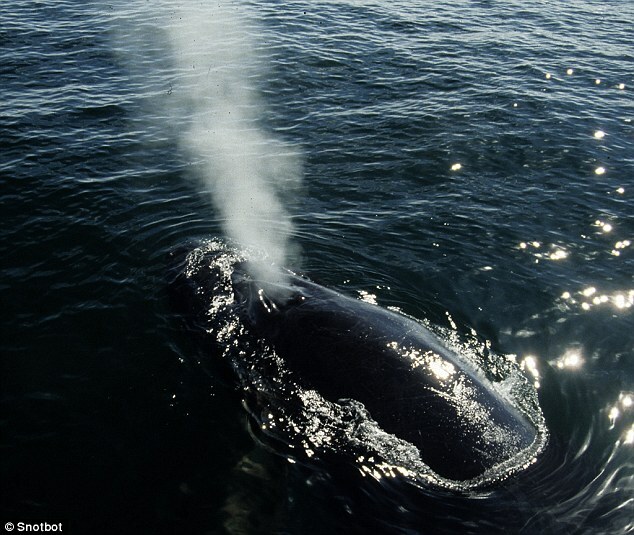 He analyzes the whales’ identities by looking at age, health and any signs of environmental threats.